It’s now so obvious that the BBMP is going to spare the rich and mow down the middle-class, that it has nowhere to hide! The justification is clear. Orion Mall, Gopalan Mall, buildings owned by Actor Darshan and Congress MLA Shamanoor Shivashankarappa will all be given the go-by, as the BBMP bulldozers head – they say – to the areas that have been shown as being prone to flooding. Ahem! We already know that houses built on storm water drains block the water flowing into the lakes and rajakaluves. So shouldn’t that be the aim – raze all the structures BBMP, why be so selective? Surely, a mall sitting on a storm water drain in the centre of the city, poses as big a risk as the house on the kaluve in the outskirts! The BBMP, which has been vociferously declaring that the high and mighty will not be spared in its current demolition drive, has made a complete ‘U’ turn when the push came to the shove. Just as the Orion Mall, Gopalan Mall on Mysore Road and the homes of Sandalwood star, Darshan and former minister, Shamanur Shivashankarappa appeared on the radar of its bulldozers for the violations they are allegedly guilty of, the BBMP commissioner and Mayor have decided to change tactic and give thrust to flood-prone areas, while keeping the rest pending for a later time. Ask him why the sudden change in priorities, and Mayor Manjunath Reddy says the orders have come from Chief Minister Siddaramaiah, who wants the BBMP to focus on flood-prone areas in its demolition drive. “I don’t understand why these officials went to areas like Rajarajeshwarinagar where there was no flooding,” he said, however, claiming that all encroachments on drains would eventually be cleared. BBMP commissioner N. Manjunath Prasad too has now ordered his men to chart a plan of action focusing on flood- prone areas. Top priority will be given to removing encroachments on drains that link one lake to another, say officers, quoting the change of plan dictated from the top. The joint survey report, which will decide the fate of the house owned by Sandalwood star, Darshan and the hospital belonging to former minister, Shamanur Shivashankarappa has not been submitted yet to the BBMP Joint Commissioner of Rajarajeshwarinagar zone, Dr. B. Veerabhadrappa. 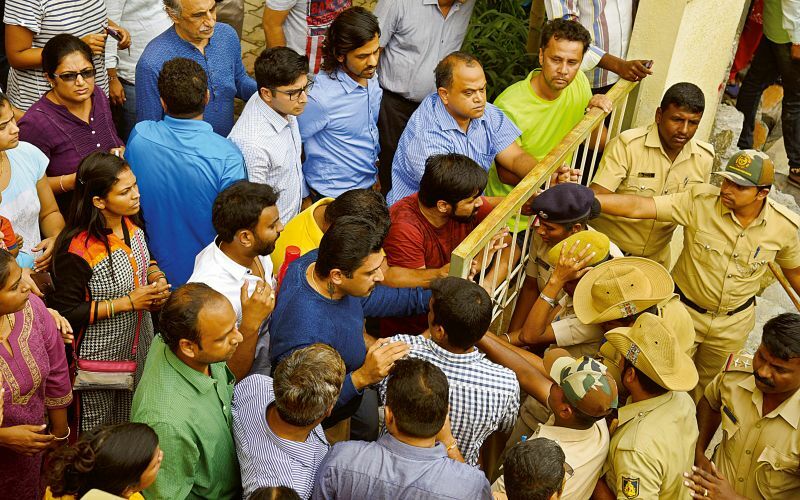 “We can only act once we get the joint survey report on the properties owned by Darshan and Mr Shamanur Shivashankarappa,” the officer said when contacted. He, however, said he hoped to get the detailed joint survey report by Friday. Asked if the delay was deliberate, Dr Veerabhadrappa replied in the negative, asserting that no attempt was being made to protect anyone. “We will treat everyone equally, no matter how big or small they may be,” he maintained, however, admitting that greater precaution was being taken in the case of the alleged encroachments made by the actor and the former minister as any small error could trigger widespread opposition. He assured that once he got the survey report he would himself visit the spot along with BBMP engineers and after the necessary inspection, give the go ahead for the demolition. Residents protest but the demolition goes on! 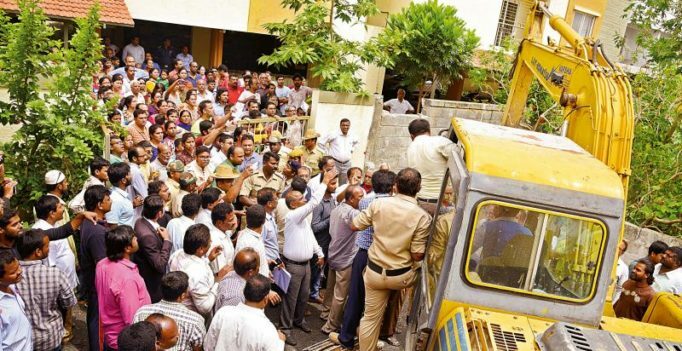 The police had to be called in to help the BBMP in Bommanahalli zone as the residents of Suraksha Golden Palm Apartments in Avani Sringeri Nagar protested and climbed on the bulldozers to stop them from demolishing the building constructed on a storm water drain. Joint commissioner Muniraju of Bommanahalli Zone said the apartment owners wanted their building to be spared. “When our officials tried to convince them, they gathered in large number and climbing on the bulldozers, prevented us from doing our duty,” he recounted. Although the people claimed they had not encroached on a storm water drain, the officials showed them the necessary documents to prove they had, he said. “But they insisted the officials change the plan of the storm water drain and spare their apartment. 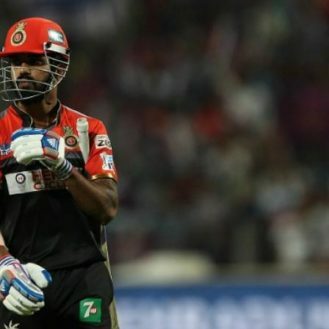 We had to resume work with police protection,” Mr Muniraju added. 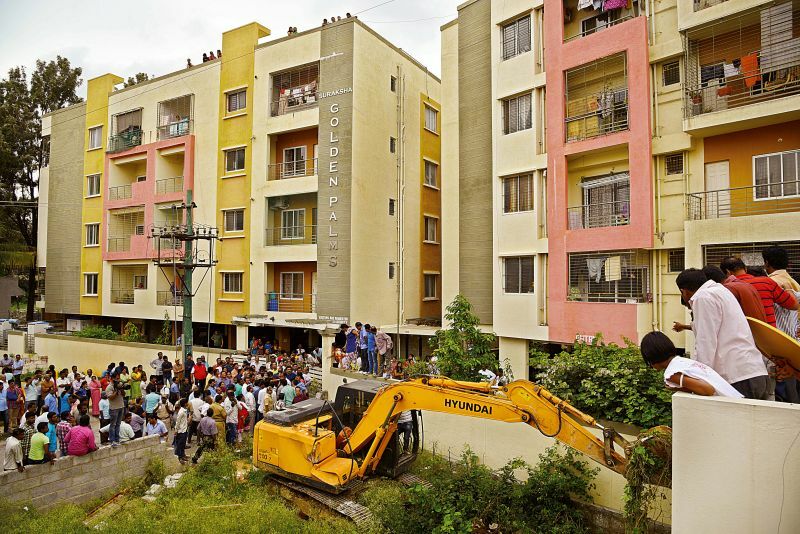 Expressing their anger over the BBMP, residents of the apartment said there was no encroachment done by the builder. BBMP has changed the map and is going ahead with the demolition, which will affect the apartment, a resident alleged. The drive is currently to clear encroachments over the storm water drain stretching from Madiwala lake to Abhaynagar lake. It would continue, if need be, with police help, he asserted, revealing that it could take a few months to complete the demolition drive in Bommanahalli zone. There is widespread protest against the demolition drive as people feel it is targeting the poor and middle class and sparing the rich. The demolition drive is not against the rich or the poor. The whole drive is against the encroachers. Rich or poor, an encroacher will be treated as one. We are not turning a blind eye to violations by big builders. But we have prioritized the demolition drive , giving special preference to flood-prone areas like Bommasandra and Madiwala. Property owners and residents say they are not being given enough notice. In areas like Bommasandra, the markings for demolitions were done six months ago and in Rajarajeshwari Nagar and Dasarahalli, the people themselves are removing the encroachments. We have given them enough time. What rehabilitation plans do you have for those who have lost their properties? The drive is to get back government properties that have been encroached on. We are willing to help the poor victims and have already started to collect their details. We will get a clear picture after meeting the Chief Minister on Saturday. How do you plan to prevent future encroachments? The demolition drive has sent a strong message to encroachers that they will not be spared and this will act as a deterrent. We will not take encroachments lightly. For how long will this demolition go on? The Chief Minister has given us four months time to clear all encroachments over storm water drains. We hope to complete the drive in this time. People are upset that properties they purchased with all approvals are being demolished mercilessly. How do you plan to safeguard others against such a fate? A system will be put in place where people can check the legality of the property they are going to buy. Arrangements are being made to place the property details along with a map in public domain. What action is being taken against officials who granted permission for buildings to come up on storm water drains? They will not be spared. Actions will be taken against them. Already cases have been slapped against 20 BBMP officials. The discovery was announced Thursday, exactly 75 years after the submarine was scuttled by its commander following a clash with the British destroyer HMS Westcott….